3GP format is very common format for Symbian mobile devices. Mostly all Symbian mobile devices play the 3GP format videos files. This format files can be played on the windows operating system using media players software’s but if we talk about the Mac then it is really very hard to play these files. On Mac MOV format is supported by the official player of the Mac OS. To play a 3GP file on the Mac OS you have to convert 3GP to MOV format then only it is possible to play the videos. In this guide we will share information about how to convert 3GP to MOV format easily. Online converter sites works only and always convert the videos without any installation on the system and people get the hassle free conversion.  There are many online converters available over internet but KeepVid Online Video Converter is the best one because of the number of supported formats and output quality. It always converts the videos in high quality and users get the original quality output after conversion of their files. It supports 60 audio video file formats for the conversion. You can also use alternative methods for converting MOV to 3GP with easy steps. Check it out. 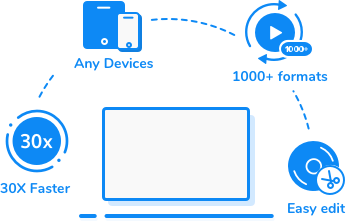 KeepVid Video Converter can help you if you need the video in the high quality formats using converter software on desktop without any hassle of using internet. This software helps you to make improved quality videos after conversion. This is fully features program so you can easily download, convert or edit the videos using this program. Convert videos and audios from one format to another quickly with 30 times faster speed. There is 1000+ formats compatibility in this program. Edit the videos with this program so you can add watermarks, subtitles, trim and crop videos using this program. Merge many videos together and make a single video in the same format. Convert more than one file together in batch using this converter. 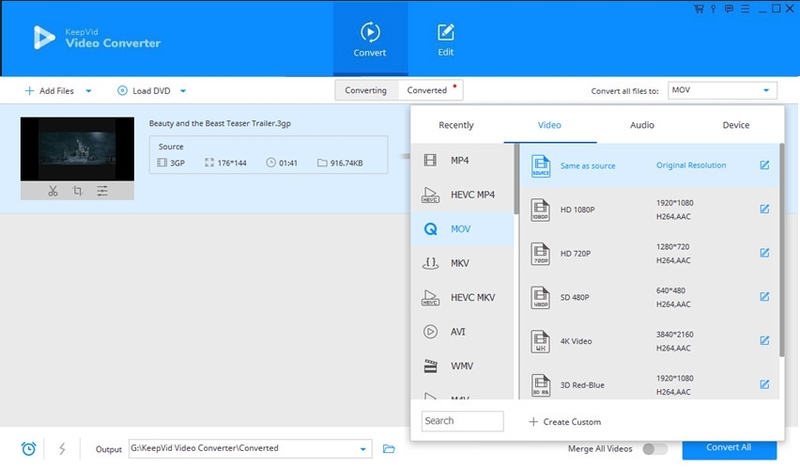 Step 1 – Start KeepVid Video Converter and add 3GP file from your computer. Step 2 – Click the menu icon at the upper right side and choose MOV as an output. Step 3 – Click Convert button to start converting 3GP to MOV. Install the MOV converter software and launch it. Click the “Add Files” and browse the system for the 3GP format videos. You can add multiple videos as well. After choosing the videos click the “Open” button to add files. Click the inverted triangle button in the top right side of interface and choose MOV from the video tab as your output format. Click the “Convert” button in next to the added video or click the “Convert All” at the bottom right to begin the conversion. MOV format file is a development of the Apple. This format is compatible with the windows and Mac operating system but you need right player to play this format on the windows such as iTunes. This is a container format so you can store multiple types of media files in a single format. It can hold audio, video and subtitles in the videos.